At prayer services each week synagogues around the world chant the same selection from scripture. 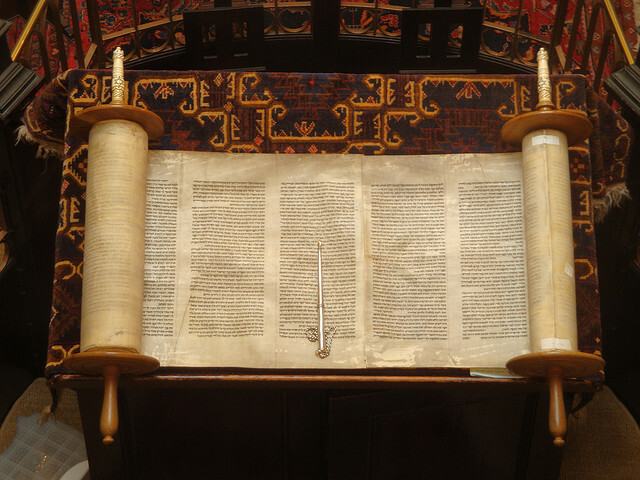 Starting right after the Jewish New Year, we work our way through the Torah scroll to complete the five books of Moses in time for the next Rosh Hashanah. For many, the Torah ceremony is the highlight of the service. The text is traditionally divided into 54 portions, which are sometimes doubled up to coordinate with the vagaries of the calendar. Right now we’re reading from the latter part of the book of Genesis, which details the story of Joseph in all its complexity. Sitting in services this past Shabbat, I listened to the bar mitzvah boy speak eloquently about the work of the Innocence Project, creating a compelling connection with Joseph’s imprisonment after being falsely accused of consorting with Potiphar’s wife. Meanwhile I was thinking about the Joseph narrative in a different way, seeing it as an example of how visionary leaders develop. The young Joseph speaks of his dreams, and while his father seems to sense that they contain truths, his brothers cannot accept what they hear. Perhaps this is due to Joseph’s youthful arrogance or his lack of expertise in expressing himself and influencing others. Maybe it stems from the limits of the brothers’ comprehension, or perhaps the timing is just not right. The story suggests to me that something more is needed in terms of the messenger and his message. I began to think about the parallels between the Joseph story and my encounters with coaching clients who face difficult choices as congregational leaders. It is through his subsequent trials that Joseph grows as a leader, honing his abilities to communicate what he sees and to connect with his audience. Finally his talent matures to the point where it is recognized by others, the truth of his vision is accepted, and he is elevated through the ranks. Joseph goes on to demonstrate that he has grown into a capable and compassionate leader. The text reminds us that hardships are one way that we learn the lessons needed to become the leaders we were meant to be. It encourages us to be like Joseph, growing through our trials and continuing to forge ahead rather than retreating when scarred, so that we too may become capable, compassionate and visionary leaders. We all come up against difficult circumstances, move through them, and eventually emerge out the other end. Through our successes and failures in dealing with tough situations we begin to learn how to handle them, and we develop confidence in our growing abilities. We build empathy for those in similar straits, and we discover more about ourselves, cultivating the self-awareness that serves as the foundation for all leadership development. One thing we learn is to address difficult issues while we still can, rather than avoiding the signs of conflict and allowing situations to fester, become more emotionally fraught, and escalate beyond our control. We develop the leadership muscle called “managerial courage”—the ability and willingness to say what needs to be said and to do what needs to be done. Challenges build character and develop leadership. We learn that to effectively serve our mission and our people we must respond appropriately to the circumstances facing us, even when we’d rather not have to deal with them. We learn to adopt the approach best suited to the situation, even when it’s not our preferred or most comfortable way. Sometimes this means addressing the situation promptly and directly, and sometimes it means holding back until the timing is right. I recently coached a congregational leader facing the need to fire a younger staff member. It was a supremely difficult task for her, but she did not shirk from the responsibility. We discussed how rough early-career setbacks can be, and also how they can end up leading to greater career success in the longer term. Setbacks and failures are wake-up calls that enable us to receive the messages we need hear, make changes, and get back on the right track. Employees have a right to know where they stand, and to receive timely information that affords them the opportunity to improve and to grow their contribution to the congregation and to their own careers. The courageous and compassionate leader shares performance information with staff members and takes action when necessary, before behavior becomes so ingrained that change is difficult or even impossible. Sometimes our duty to the mission and to others requires painful action. In our coaching conversation, the leader confided that she herself had been fired from a position earlier in her career. She related how this setback had required her to rethink her approach, eventually enabling her to move forward in a more fruitful way. I shared my experience of losing a job during a bout of corporate downsizing, and how the result had led to a broadening of my own experience and eventually to a new and more satisfying career. Facing difficulties is an important part of growth and development, our life’s work that is never completed. Like Joseph, we carry with us the scars of our trials. The story of Joseph reminds us that setbacks are not irreversible endings, and that by integrating the learnings of experience we can become the leaders the world needs us to be. Linda Rich, an organizational consultant and executive coach with the Alban Institute, specializes in leadership development and congregational revitalization.